The PYP 2 was humming with activity in the second week of February. Their journey of expressing themselves creatively was finally culminating on February 7th. Both the classes had been clamoring to take home their artwork from their unit about expressing their ideas creatively. But we had a bigger, bolder plan! We had plans to expand and extend the creative unit; giving an opportunity for the learners to express their ideas and reflections from the next unit about how journeys can help discover the world around them. So the learners journeyed deeper into their art by expressing their own experiences, feelings, reflections, and changes creatively through art. 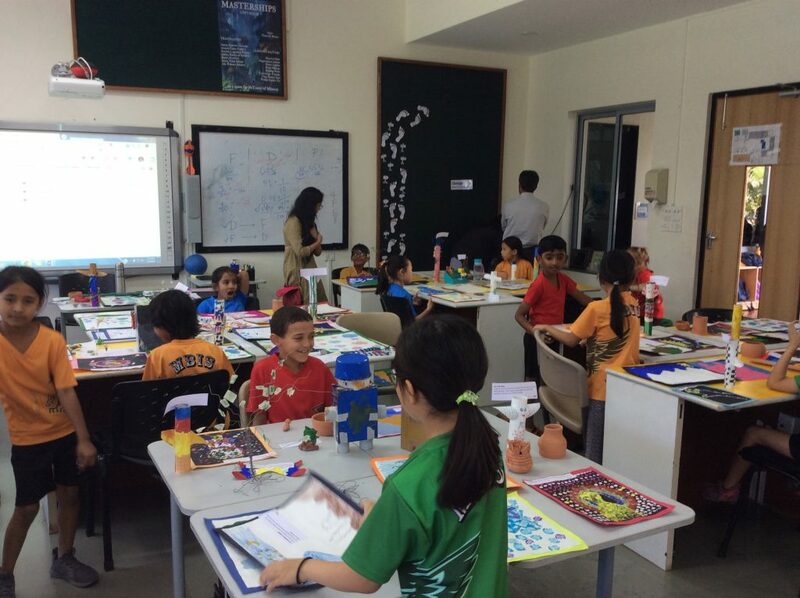 The Art Exhibition was planned to be held in the PYP 5’s beautiful, large, light-filled classroom which they kindly lent us for 3 days, as they were out for their annual field trip. Having three days to plan, set up, arrange and display the artwork was a huge blessing. So a big thank you to the PYP 5 who enabled us to display and share our artwork with parents and also gave our artists a platform to share their work with the whole PYP! During the week- the countdown began with the students having a good look at their own artwork, writing down the artistic intent behind their creations and reflecting on the tools, techniques, and inspiration behind the art. They sifted through all their artwork, examining it to find their best work. We were surprised to see our artists comb through their various art pieces and nonchalantly discard beautiful, colorful, creative art pieces as not worth displaying. Not only did they set their standards high but they were also selecting pieces which had a deeper meaning and emotional value to them. In the end, most of the students had just picked maybe a quarter of their work to display. On the 6th, the PYP2 learners traipsed up to the exhibition space where all the wheelie boards were ready, empty and waiting. A serious round of brainstorming about how the display could be organized ensued. Many opinions were voiced, examined, questioned, supported, changed and many decisions were made in a calm, consensual manner. It was a great opportunity for our students to use their organizational skills in a real-life situation of organizing their own event. This was an authentic IB transdisciplinary opportunity where the students used their skills acquired in the Transdisciplinary theme of How we organize ourselves in the display of their work in the How we express ourselves unit which extended over the Where we are in place and time! Yes, that was a mouthful, but in essence, it was an amazing exercise in student agency, voice, and choice. It also included both, work in the homeroom and work from the Art specialist lessons. Throughout the day the students designed and made the display for the boards to direct parents to the Exhibition area, a board to announce the Exhibition, and also a board to explain the unit and the purpose of the Exhibition topped with inviting messages for their parents. They helped decide which boards would display the collaborative class art and which boards would display the art integration work which they did with Ms. Charmaine in the specialist art lessons in the art room. The cool, bright day of the 7th was laced with trepidation and anticipation as the learners came in eager to enjoy their day in the limelight. They scurried up and down the stairs, carrying their many art pieces, models and collaborative work. They worked in unison, as a team, carrying up last minute supplies to make last minute repairs, adjustments, and additions to their work. They were amazingly cooperative, focused on the tasks and worked collaboratively so that each artist had enough space to showcase their work. And of course, all of them practiced how they would explain their work to their audience. The parents snaked between the boards which housed the visual integration art pieces. The visual art integration was a collaboration between the visual art and the homeroom wherein the students were exposed to artworks over the ages and focused on content, style and how tools and materials have changed over time. They produced their own artworks from different periods in the style of the period they were studying. They were introduced to and encouraged to explore different media for each piece of work. The students thoroughly enjoyed their experimentation with the media developing definite favorites. Throughout this collaboration, the students have been hard at work on their art since October both in the homeroom, as well as, in the visual art room. First on display was their learning engagement on the study of cave art. They had used charcoal for their own artworks, burning the edges and using a “coffee wash” to make it look ancient and authentic. The next set of work on display was their study of the works inspired by Vincent van Gogh. The learners had viewed examples of his art to examine, interpret and discuss style content and technique. Using his ideas and style as inspiration, they went on to create their own versions of his most famous artwork, Starry Starry Night using oil pastels. Moving through the room, parents viewed the young learners work inspired by the contemporary artist Laurel Burch. The learners were captivated by her colorful, childlike drawings of cats and very interested to hear that her works were printed on utility items that could be used daily! 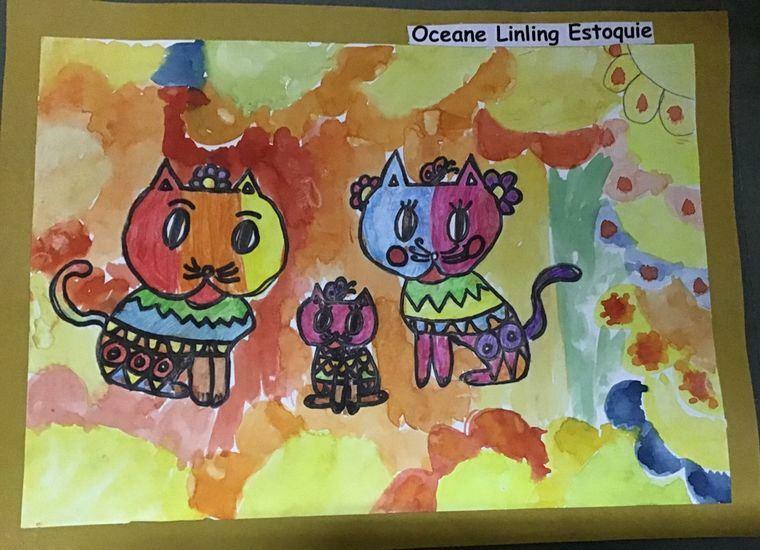 What followed was their take on Laurel Burch inspired cats using watercolor paint and pencils. Rounding off this PYP integration display was their collaborative artwork on their most memorable moments during the Durshet field trip. Some of the learners also expressed some preconceived ideas that they had about their journey into the jungle at Durshet. We saw some colorful lions, tigers, and snakes in their artwork. Pausing to look at the collaborative Village model and the Robot models, the parents then made a beeline to their own child’s display. The display ranged from clay work, wire dragonflies, models of houses with swimming pools, rope ladders, zip lines, totem poles, paintings, and aborigine art inspired artwork of their dreams. It was wonderful to see the learners bask in the golden glow of their parent’s pride and appreciation. They took on the responsibility to show their parents around the art displays explaining to them in detail and pointing out their favorite items. The parents, in turn, walked all around the displays appreciating the artistic expression of all other artists too and leaving comments. An appreciative grandparent rued that as children they never had such opportunities to express themselves as they wanted! The finale of the exhibitions was a vignette of their videos of their play scripts. The parents looked on with indulgent humor as the children giggled when they saw themselves acting out their characters in the play. It was a great way for the learners to showcase how they can express themselves through voice, actions, facial expressions as well as costumes and props! The room was buzzing with eager voices of children, proud beams from the children and parents alike, appreciative talk and looks of wonder as the day ended gloriously -celebrating our learners’ journey of expressing themselves through art!